Every year the overall theme is “Learning Impact” – which is IMS’s branding for how to apply technology to better support effective teaching and learning. Every year we look at innovative educational models, innovative technologies and the application of IMS’s ecosystem and open architecture to better enable these. We call it a “leadership institute” because leadership in EdTech requires understanding how new models, technologies and architecture are going to come together to enable the future – either within your institution, your products or your nation state. As we get close to the event the IMS staff and members are working to hone in on the “hot topics.” For us this is about not just understanding but taking forward-looking action to advance the open architecture to enable educational innovation. This year for the first time there will be a special set of wrap-up meetings at the end of the conference, one for the IMS technical community (see the IMS Technical Congress Summit) and the other for the IMS institutional community (see The K-20 Institutional Priorities and Collaboration Summit). What is your digital curriculum strategy? Answering this question is the leadership you need going forward. In addition to a lead off keynote from one of the world’s foremost experts on science and technology education, Dr. Freeman Hrabowski, President of University of Maryland Baltimore County, we will have a killer K-12 curriculum leadership presentation and panel led by LeiLani Cauthen, CEO of the Learning Counsel (who has traveled the country engaging superintendents on the curriculum strategy challenge). Dr. Hrabowski’s presentation and challenge to the IMS community will coincide with the release of a new book he has written on the topic, “Holding Fast to Dreams.” The book shares a holistic view on how we must work to support the educational success in science and technology for all students. Attendees can get a signed copy immediately following his opening keynote. K-12 community leadership in IMS on the digital curriculum strategy issue has been nothing less than phenomenal over the last year, receiving quite a bit of media attention. This leadership has lead directly to several breakthroughs in interoperability, namely Thin Common CartridgeTM and OneRosterTM. And, there are two other initial implementations that are likely to turn into IMS standards: mobile single-sign-on LTI and LTI search service. K-12 suppliers are responding nicely with a next generation of interoperable platforms, content and tools. Yes, there is a long way to go, but the directions are very promising – the right conversations are happening at leading institutions and the technology infrastructure is taking shape. HED has only had small pockets of institutional leadership on digital curriculum strategy, since most decisions are made at an individual faculty level in HED. But strong leadership is occurring via organizations like the University of Phoenix and the Unizin Consortium. The strongest trend we are seeing in HED is the rising of the academic technology support groups to help faculty integrate, and in some cases develop, a variety of innovative learning tools (using LTI® of course!) to fit their needs. I expect that we will see and hear about lot’s of exciting developments from both traditional and up and coming publishers working on HED digital curriculum as we do each year. 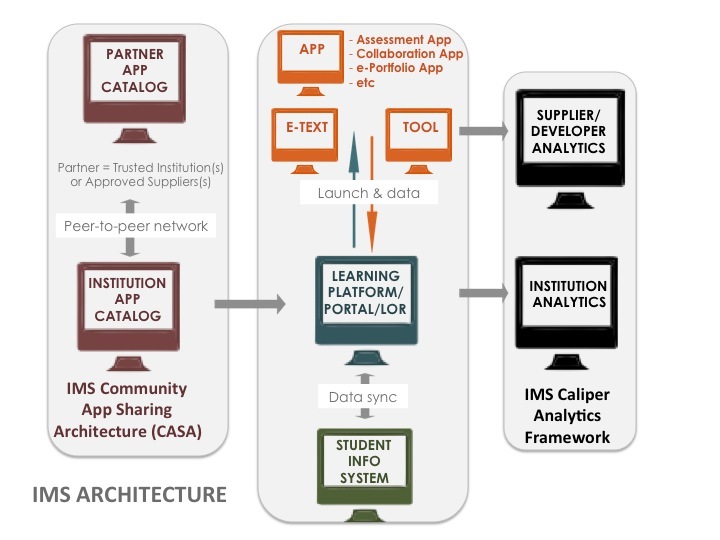 IMS has been working with suppliers and institutions via the IMS Caliper AnalyticsTM initiative to provide both a framework and usable code to enable institutions to answer this question and suppliers to fit in. Caliper has made incredible progress over the last year with fielded systems now generating millions of Caliper events a week – all based on a framework that a diverse set of suppliers and institutions could agree on from the start. This has huge potential ramifications on getting beyond today’s dirty data machinations. However, IMS is also tackling the issue of meeting the today’s dirty data world half way. IMS recently launched Caliper RAM (real-time analytics messaging) led by a marquee group of universities who have their own ideas on how to apply Caliper to rapidly evolve existing systems, such as learning platforms and data warehouses, to something much more useful to institutions than what they can do today. In the next year we will see the beginnings of profound changes in the data architectures of leading IMS institutions and edtech suppliers. In K-12 we are already seeing movement of leading suppliers toward Caliper. However, institutions are primarily interested in getting enough “data” to power recommendation engines and support the overall trend toward greater flexibility in curriculum resources (see next item on Integrated Assessment). What do we mean by Enabling? Simply that the effective use of data in education is in its infancy and therefore, while IMS has plans for scale, we are constantly honing in on big impact from very focused and simple data constructs – epitomized by something we have been calling the “engagement profile” (but really probably needs a better name). In the U.S. since 2000 there has been an obsession with “no child left untested.” While the intentions were good there have been some unintentional consequences, namely focusing on tests rather than learning. In recent years the attempt to improve the situation with better thought out approaches, namely the Common Core standards and the Race to the Top Assessment initiative (which feature better curriculum models and much more innovative testing constructs) have been met with a lot of resistance because they still look like the same thing to most people. In the meantime other parts of the world have come to the realization that paper testing that can be replaced by e-assessment should be, because of dramatic improvements in time to feedback and saving of processing costs. From the IMS perspective there has been some very good news out of all of this that the IMS standards have had no small role in. Interoperable assessment alternatives make it possible to do what we are seeing convergence on, namely utilizing assessment of myriad types in myriad ways during instruction to get the data to students, parents and teachers – and thus help them directly. Some would call this “formative” assessment or “authentic” assessment. Interoperability of diverse assessment tools and item banks via standards like LTI, Common Cartridge, QTI and APIP are bringing together instruction with assessment in ways that gets us away from teaching to tests and toward rapid feedback to those that need it. While much of the benefit of the above is in K-12, HED is also experiencing a resurgence of interest in e-assessment. 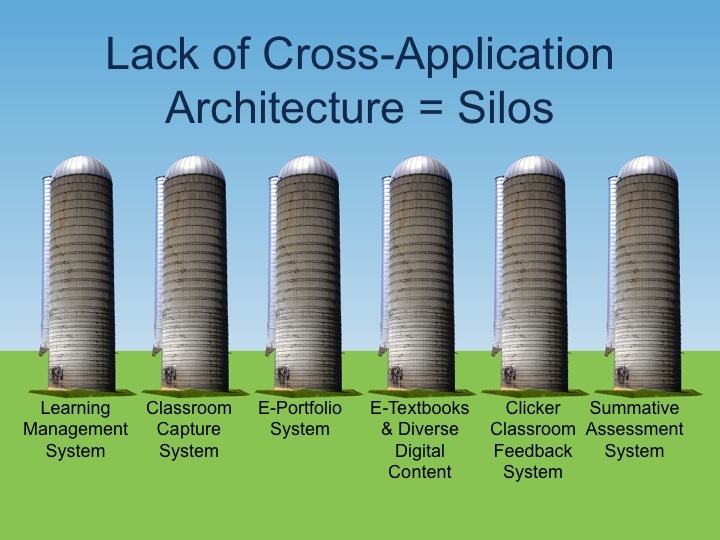 Some of this is simply better integration, and therefore usability, of assessment products (formative and summative) – one of the strongest holdouts in terms of being “silo’ed” within the academic enterprise. But there are other areas of innovation in HED including adaptive content systems and emergent e-assignment products (areas of strong participation in IMS for years). Competency-based education (CBE) is another hot topic in HED. 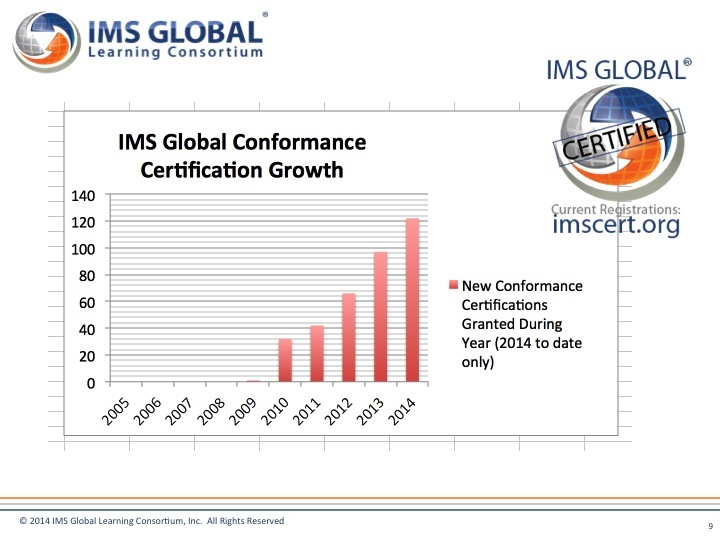 IMS is leading the way on interoperability of competency constructs for use within institutions. This includes digital extensions to the traditional transcript motivated by the very obvious fact that CBE will be most valuable to students if they can claim such on the official student record. IMS is working closely with registrars, academic leadership, IT and suppliers to move this forward in a pragmatic fashion. 2015 will be a year of substantial progress. However, the above CBE/transcript innovation is really potentially a subset of a larger trend, sometimes referred to as “badges,” but what IMS likes to call “Digital Credentialing.” There is a strong move afoot to capture digitally a wide range of human accomplishment in many settings, including education and training. 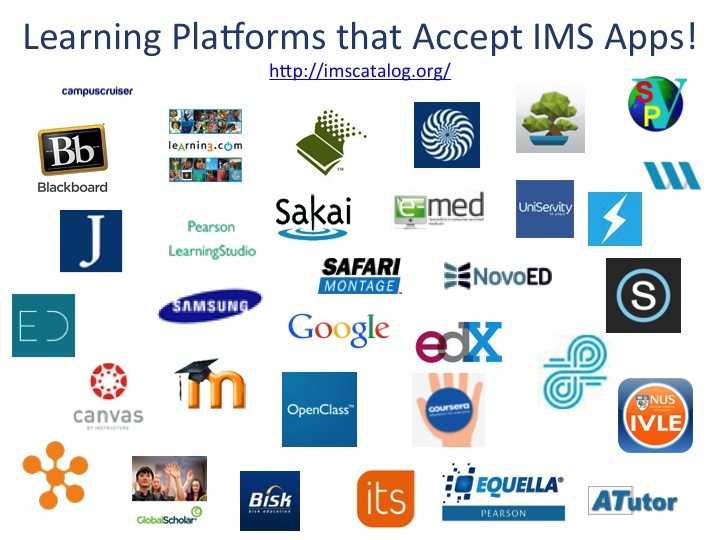 IMS has a long history of standards that are connected to this space, such as IMS e-portfolio, learner information packaging, etc. IMS is actively moving on plans in this area to be highlighted at this year’s Learning Impact. And the Future Learning Platform Will Be . . . .
All of the above folds into our penultimate panel regarding the future of the learning platform, this year entitled, “What Will Become the Core Learning Platform for K-20 Education?” moderated by Scott Jaschik of Inside Higher Ed. Please note that this panel has traditionally been a great predictor of where the mainstream will be in about 3 years (for instance see this summary blog post providing analysis that indicates Canvas is moving in the right direction and why). As discussed elsewhere, we are expecting big movement in the next three years with respect to learning platforms in K-12, HED and cutting across. Some be a fun and insightful Learning Impact! The Future of EdTech starts here! If you want to know what your future will look like take a look at what you are thinking about today. What is IMS thinking about as we begin 2015? 2015 is going to be a supercharged year of additional progress on the open digital revolution in education via IMS Global. 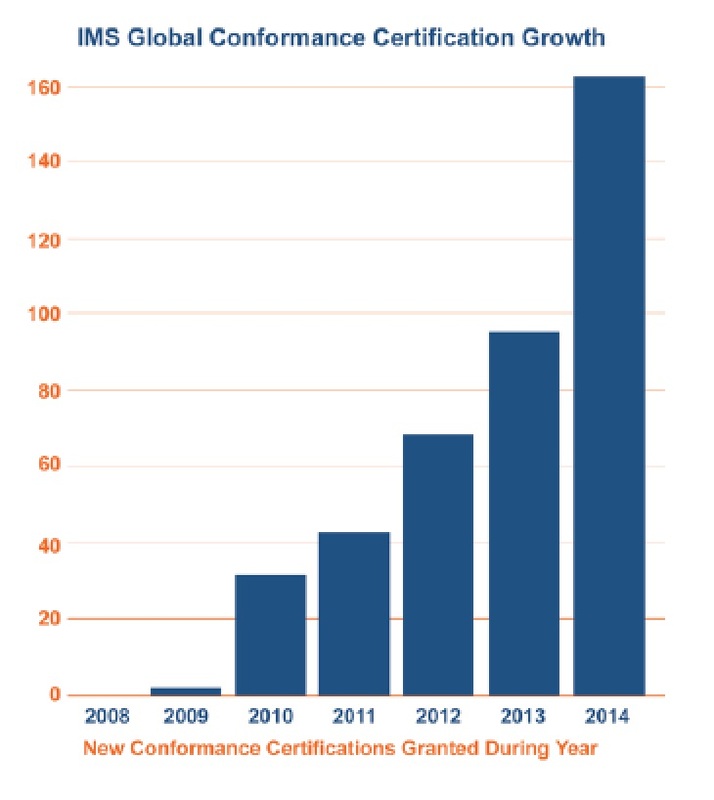 We’re over 280 members, over 400 conformance certifications strong now: without a doubt the largest edtech development community on the planet – and the only one that cuts across all product categories and suppliers. 1. Transition from LTI 1 to LTI 2: By the end of 2015 I guarantee you will be wishing your LMS or your product was LTI 2 certified. Why? Because LTI 2 removes the final barriers to achieving 1-click integration of educational apps. Once you experience LTI 2, LTI 1 will seem like a distant memory. Note: If you are not yet anywhere on the LTI adoption spectrum don’t dismay – we will help you start on LTI 1 in a way that will get you ready for transition to LTI 2. Thank you Vital Source for leading us on LTI 2! 2. Deployment of very important LTI services: Rich outcomes, gradebook and content item: Part and parcel to the transition from LTI 1 to 2 will be market deployment of some essential services that the sector has been shouting for. These services will work with either LTI 1 or LTI 2 and provide some very critical functionality (hopefully the names are pretty self-explanatory). 3. Community App Sharing Architecture (CASA): Mi casa es su casa! Dear CIOs – it is time to transition your students/faculty from being “users” to “choosers.” CASA is a peer-to-peer open source reference implementation for an institutional app catalog, based on open standards, for your LTI and mobile apps. We will see the first operational deployments shortly. Thank you UCLA for leading us on CASA! 4. K-12 Searchable, Learning Objects-based Publisher (large and small) Content: In 2014 something amazing, called the “thin Common Cartridge” emerged from Orange County Florida, HMH and SAFARI Montage. 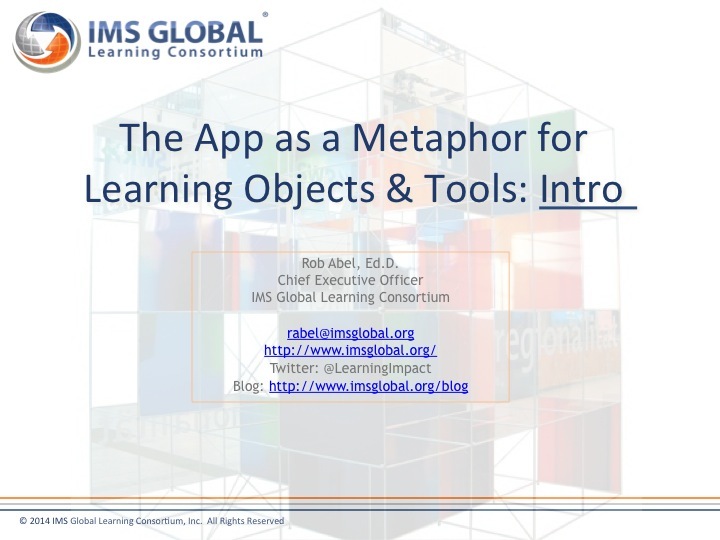 As a guy working on enabling “learning objects” since 1995 – well, this is the first approach I’ve seen that seems to actually make sense for all parties concerned. Indeed HMH now has over 200 titles available as Common Cartridges and we've got a new conformance certification, including K-12 metadata, for the thin Common Cartridge. Also, TCC is easier to implement than the full CC for the learning platform providers. In 2015 will see acceleration of market adoption of TCC and some related work, including federated search will be sorted out. 5. Learning Information Services: I’ve often been worried about the market adoption of this important standard for syncing student information between SIS systems and learning systems, but the reality is that important adoptions are continuing to occur – the issue has really been the glacial speed at which SIS systems are evolving in HED (the core adopter of LIS). But, I’m expecting some significant new adoptions in 2015, as well as some potential breakthrough application in K-12 (see next item). 6. K-12 Rostering & Gradebook: Aggressive adoption of LTI in K-12 among some key leading districts as well a turning tide against business models like Clever (aka let’s try the per drink model again that has failed so many times already in the education space). Districts and suppliers have decided to apply a combination of LTI, LIS and reality to rapidly achieve a vendor-neutral community-owned opens standards-based approach to enterprise app/content authorization. First implementations/deployments? 30-60 days from now . . . Some of the newer IMS K-12 members as well as some of the long-time members are taking the lead on this. 7. QTI v2.1+ and aQTI: The Next Generation: Like LTI, I expect 2015 will be the year that if by the end you are still on version 1 of QTI (the version supported natively in Common Cartridge and most LMSs) you will be pretty far behind. In 2014 the assessment community, now the largest single segment of IMS members, proved to any doubters left that QTI v2.1 is ready for prime time use and conformance certification. However, they also identified where they want to go next – which is an end-to-end accessible version of QTI (think APIP) but with better support for assistive technology and serving as an actual rendering format (versus just an interoperability format – which is what QTI is) for the range of devices supported via the web. They are calling this aQTI. Some long time contributors, such as ETS, along with some newer IMS member organizations, like Dutch Exam Board, Cito, TAO, NWEA and Smarter Balanced are leading the way on all of this. 9. Caliper Analytics: Hotter than hot! Many thanks to the Bill & Melinda Gates Foundation for awarding IMS a 3-year grant to accelerate adoption of Caliper and LTI in the education space. Lots of code has been generated, led by McGraw-Hill, Elsevier, Intellify Learning, D2L, Canvas among others – but 2015 will see actual deployments. Analytics is kind of a 20-year horizon project in education if you consider all the pieces. But, that does not mean that there is not some low-hanging fruit to be harvested. See it begin to happen in 2015. 10. Extended transcript/Student Achievement Record/Competency-based Education: In 2014 IMS learned from some of our members who have been leading an area that all education enterprises need to get better in: defining and authorizing a more robust set of outcomes or achievements beyond grades. I’d like to tell you that we have this all figured out from a standards perspective – but we don’t. We do have some historical work and some newer work that seems to be potentially relevant – along with some great partnerships we’ve established with C-BEN, AACRAO and JISC, among others. 2015 will be the year we focus in on one or more specific areas under this category that we feel IMS can make a lasting contribution. We also have a variety of leadership councils/advisory boards for specific groups (like K-12 school districts/state departments of education and Connected Learning App Community) or specific market sub-segments. Let us know how we can help you become part of the largest edtech ecosystem on the planet (whether you are an existing member, new member or non-member). Contact us. Or, plan to come to the Learning Impact Leadership Institute in Atlanta in May (or an IMS quarterly meeting). 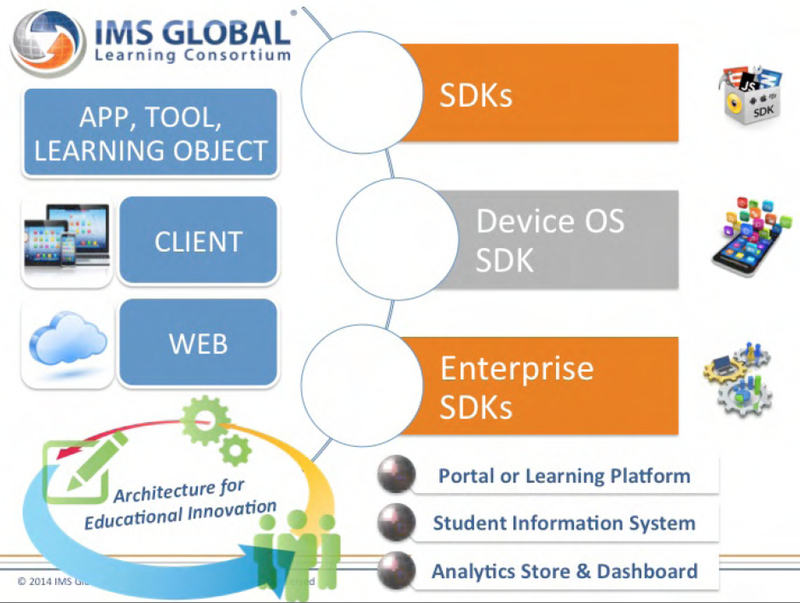 This week IMS Global released the 2014 Learning Impact Report which summarizes trends we are seeing in the ed tech sector based on the current year and historical winners of IMS’s annual Learning Impact competition. Many thanks to those that participated in the competition from around the world and, of course, the evaluators and editorial panel! Ed tech researchers or leaders interested in helping with the Learning Impact work in the future please contact us! The executive summary of the report highlights five key trends out of the 15 or so we have been following since we began the program in 2007. One of the challenges of the ed tech sector is that we don’t have a common vocabulary to describe key developments, and frequently when a common term emerges, like LMS, MOOC or analytics – they become overloaded and frequently lose their usefulness. For that reason, we have focused the LIA process and terminology around what an institution is hoping to achieve with the support of technology – rather than the buzz terms for the technology itself – and focus on actual use of the technology at an institution (i.e. real examples of implementation). Diversity of need and diversity of offering is the future of education. Massification is not the future – it is the past (leading nations and societies will find ways to move beyond the current massified, one size fits all educational systems to the next phase). Over the long haul this trend to support diversity will be the most disruptive factor in the global education sector. The consumer mobile platform providers have taught us a thing or two about how to enable the “long tail” ecosystem of apps. Education will also move in this direction to support the need for diversity. 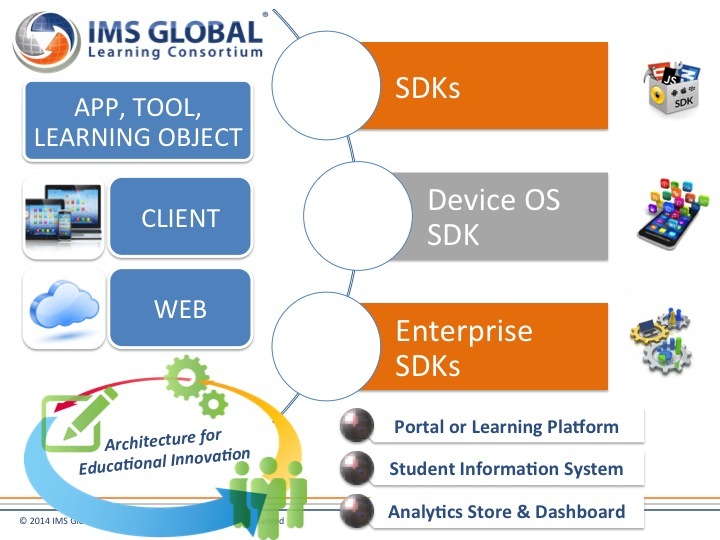 IMS Global is right in the middle of enabling this trend via standards like LTI (Learning Tools Interoperability). We have evolved to 32 learning platforms that can “consume” LTI apps and about 100 certified apps. We estimate that there are 2-3x that number of apps that are actually using LTI, but not yet certified. Why can’t we just have 3-4 platforms like in the consumer world? Apple, Android, Microsoft, Amazon? The answer is self-evident when you consider that “the educational ecosystem” must encompass integration INTO and ACROSS the world of consumer devices and apps. How will the education sector manage to stay platform agnostic while bridging this gap? No one knows for sure but an obvious solution is for the much smaller (i.e. smaller than Google, Apple, Amazon, Microsoft) education sector participants (the suppliers and institutions) is to ban together and offer a set of bridging standards that enable any platform/any app to integrate with the platform agnostic educational ecosystem. Indeed, that is the direction that the IMS work is already taking and we are now seeing examples of things like Facebook/LMS integration using LTI. For students to do better they need better data about how they are doing and what their path alternatives/recommendations are: pretty obvious idea. Indeed, most learning management products are course/teacher focused – not helpful for students or advisors focused on the academic journey/program. Institutions, entrepreneurs and the Gates Foundation are getting this in the last few years – and a range of products are emerging. D2L acquired a product called Degree Compass that fits into this category. It is still relatively early days on this trend because there are many things to be worked out institution by institution. But, the motivation to do so is now apparent for those institutions that are either experiencing marginal success (due to the changing demographics of students and employment challenges) or looking to build new relationships with employers. One of the key buzzwords today in HED is competency-based education (CBE). Competency-based programs have become closed associated with being able to get college credit for life experiences/previously acquired skills. However, as educational systems evolve “competencies” (such as critical thinking, communications, teamwork) become the explicit components of describing the goals and progress of an educational path. But, I would also argue that ability to define and deliver on competencies that are relevant to specific partnerships with corporations (such as the much heralded partnership with Starbucks and ASU Online announced within the last year) will become a key competitive advantage for colleges in the future. Eight years of Learning Impact Awards have produced an impressive group of medal winners in the educational gaming category. And, many have experienced some very excellent and mainstream games/simulations in niche areas such as graduate business schools. Yet, we continue to indicate in the Learning Impact Project Matrix that gaming/simulation in the educational sector is a ways off from being mainstream. The reason for this, of course, is that producing effective educational games that scale is expensive. The good news is that some of the award winners have been from institutions that indeed work at large scale, like Florida Virtual School. The matrix shows an interesting contrast in position with what has proven to be a learning impact leader: Adaptive learning and online homework. This category has been widely adopted due to the investment of publishers. Interestingly, we are now seeing products that feature programming frameworks that enable development of adaptive learning content. We have seen entries that have attempted to do the same for gaming and simulations. It is worth noting that there is an opportunity for publishers or institutions to invest in potentially scalable educational games/simulations. After all, isn’t this an obvious next vista for “educational authorship” beyond textbooks? The “Digital Learning Networks” category has been a shining star of large-scale impact of technology in the LIA contest since 2007. This category covers groups of institutions (national level, state level, district level, ad-hoc consortia, etc) collaborating to build out some form of technology architecture that accelerates educational progress across the group. Gartner Group’s July 2014 report on the Hype Cycle for Education covers something called “Exostructure Strategy” – leveraging interoperability to enable more friction-less partnering – whose description includes several IMS standards as the enabling technology – as having transformational potential. While we would agree with Gartner that this type of strategy is not mainstream in most institutions we would point out that this type of collaborative strategy has been very successful around the work for many years now – and is not especially difficult to implement from a technical perspective. The challenge is really cultural. A great example of an emerging collaboration of this category is Unizin – institutions cooperating to put in place a framework to ensure they can share content and leverage data. What is your digital curriculum strategy? What will become the core learning platform in K-20 by the year 2020? What does sharing pedagogical knowledge have to do with digital curriculum strategy and learning platforms? Everything. Luckily K-12 education understands the need for professional development. Unluckily, higher ed does not. Who is responsible for developing the K-12 teachers? Higher ed. Whoops! Many, many higher ed institutions have put in place web sites for faculty to collaborate – but, these efforts have stalled out due to the cultural issue of faculty independence. K-12 is now taking the lead in digital curriculum – because it has to – and it starts with helping the faculty make sense of the options available in the digital world. Since most K-12 districts invest more in curriculum than information technology it makes huge sense that the products to help faculty in this regard are accelerating. Learning platform support for professional development, including sharing of pedagogical knowledge is a key improvement area for the future. Whether or not this will be accomplished via plug in learning tools or apps versus the core platform remains to be seen. Clearly the future is coming. Wishing you the best of luck in being an important part of making it happen. All five of these areas have some pretty obvious effects on each other. We will leave that as homework for the reader ;-). 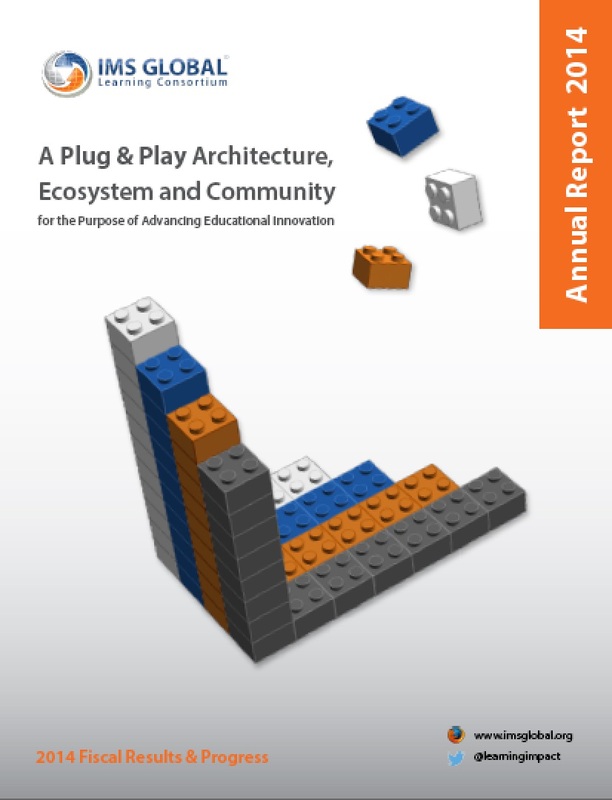 EDUCAUSE 2014 (#edu14): The beginning of alignment toward an “architecture for educational innovation”? “Alignment” is especially challenging in the world of higher education. Alignment of interests and direction is very difficult to achieve within a university structure, which have evolved to what Clark Kerr termed as the “Multiversity” (a collection of diverse communities under one umbrella). Alignment, it would appear, should be even more challenging across universities. However, there are forces at work, for instance community interaction via organizations like EDUCAUSE. Indeed, some theorists have postulated that independent institutions evolve to very similar structures not through “top down” leadership but more through practitioner community effects (a theory known as institutional isomorphism). 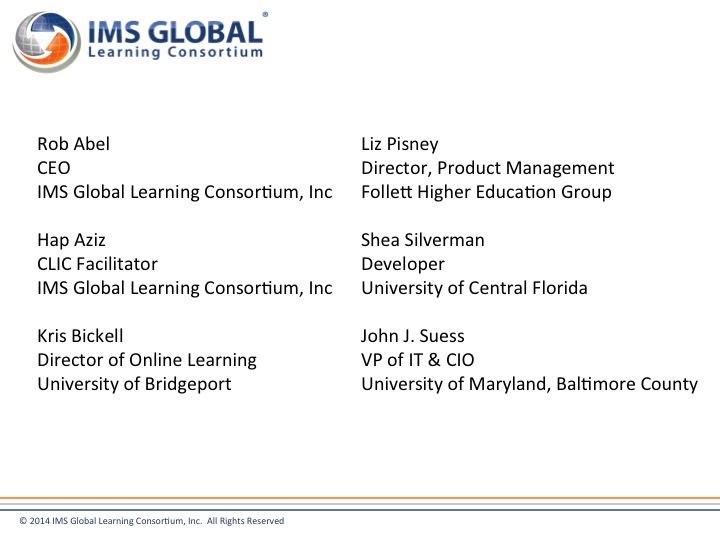 So, in practical terms, one of the reasons why most CIOs at colleges and universities seem focused on similar priorities is because they all talk to and influence each other via groups like EDUCAUSE. 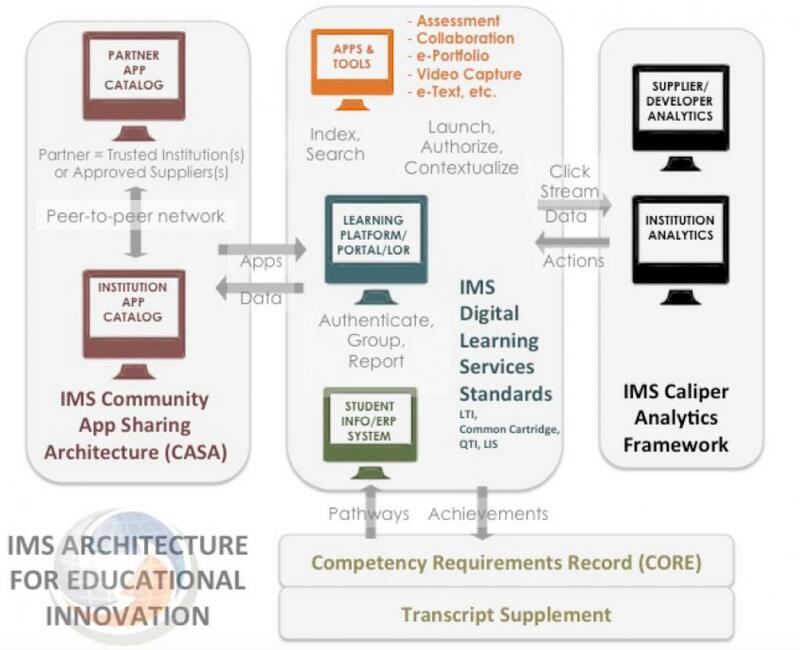 For almost a year now IMS has been talking about something we call “an architecture for educational innovation.” What we mean by that is a community owned, developed and supported set of interoperability standards that make educational applications plug and play with each other and thus allow the focus/investment to be primarily on innovative apps rather than infrastructure. 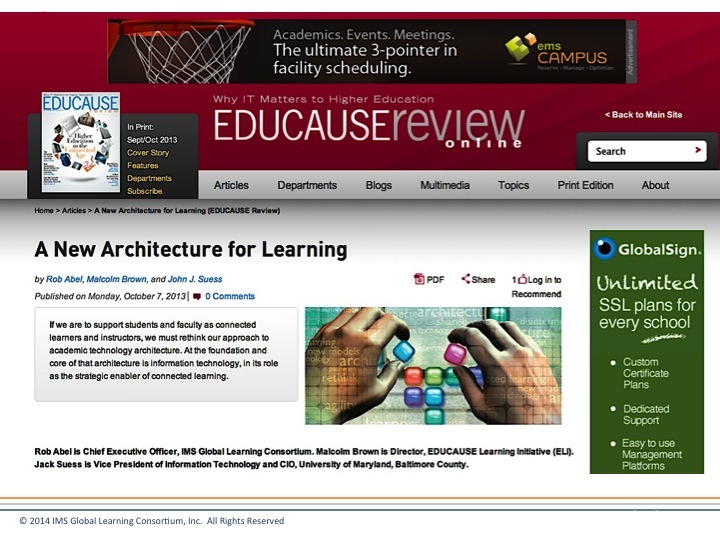 This concept started achieving clarity in the Abel, Brown, Suess EDUCAUSE Review article from October 2013, A New Architecture for Learning. IMS Global does not bring all the things needed for the architecture to materialize: Far from it. IMS brings one small but absolutely critical piece, which is an organization via which institutions and suppliers can co-create, evolve and sustain the required interoperability (call them standards if you like – but ease of interoperability is what is required, versus standards per se). Organizations such as Internet 2 bring the cloud-based infrastructure that is so critical to offloading the infrastructure concerns. Organizations like EDUCAUSE Learning Institute and the larger EDUCAUSE bring the leadership needed to make it happen. Unizin: The first of it’s kind consortium among large R-1 universities to enable sharing of content and data announced adding several new members. This is a very serious effort, reflected by the $1 million membership fee for each university, and at the heart of this effort is reliable and efficient interoperability to enable the sharing regardless of what products are used. 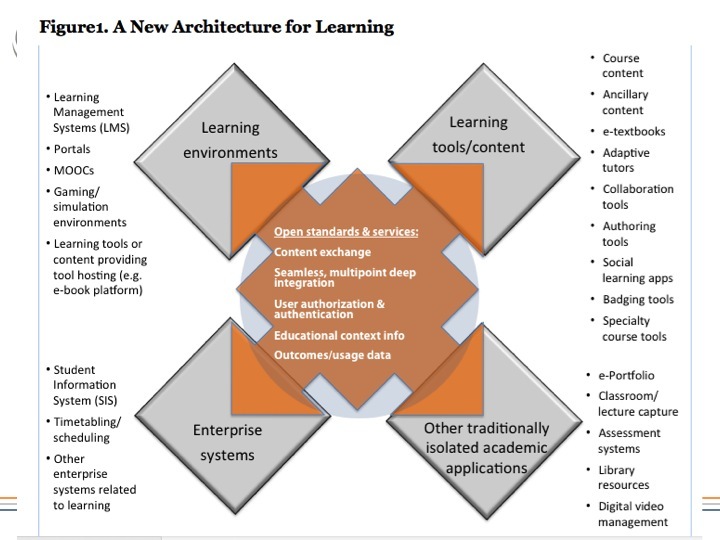 EDUCAUSE Next Generation Digital Learning Environment (NGDLE): A new, potentially well-funded effort (sponsored by the Gates Foundation) to envision and take tangible steps toward enabling a more comprehensive view of what today would be the learning management system (LMS). It is clear from the focus group of 50+ leaders that occurred at #edu14 that interoperability and the flexibility and access to data needed to improve instruction is clearly among the top three enablers for this effort. 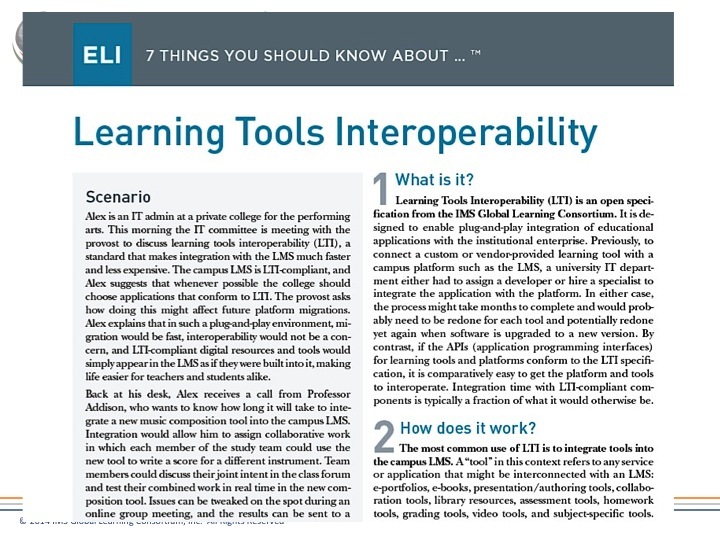 And, this interoperability will go well beyond the LMS (which despite its many detractors is typically the most open and interoperable system on campus today). Diana Oblinger: Diana received numerous well-deserved recognition at what will be her last EDUCAUSE as CEO per announced 2015 retirement. 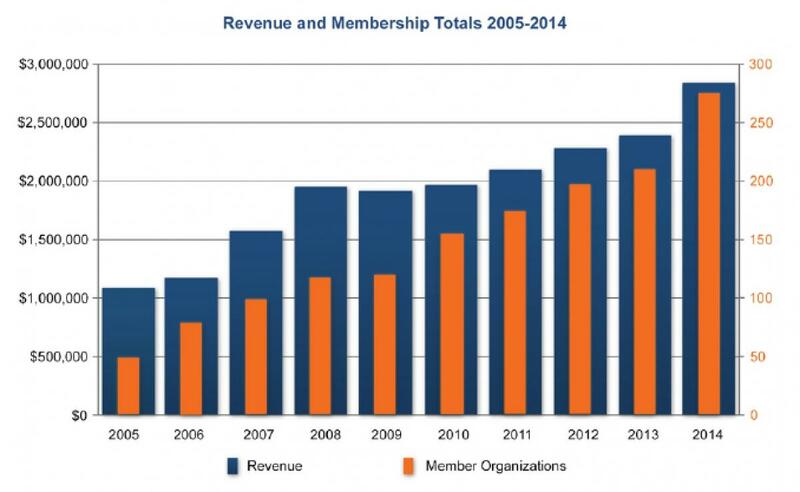 Diana has turned out to be a great fit for EDUCAUSE CEO, leading an enormous rise in stature over the last six years. However, the real news item here is that during Diana’s tenure EDUCAUSE revenues of more than doubled to over $35 million annually. How many commercial product suppliers have had that level of success during the same period? As with the prior two bullets regarding Unizin and NGDLE this success can be interpreted as increasing leadership from the institutions in driving the direction of technology. Campus Computing Survey: Once again “assisting faculty with the instructional integration of information technology” was ranked most important. The future of educational IT is not about “locking the faculty down” – it is about enabling better, more innovative instruction. Kuali project: There was hubbub at EDUCAUSE about this well-known open source ERP project adding a commercial spin-off which included questions about what would remain open source. In the architecture for educational innovation diversity and innovation go hand-in-hand. This includes (very importantly) diversity of business models. We see the evolution of Kuali as just one more example of the need to find a path that leads to sustainable innovation. If you’d like everything with respect to education to be free, then please begin with your own salary. Mobile-first products: In the last few weeks, including at EDUCAUSE, I’ve spoken with at least five suppliers relatively new to the education space, touting their “mobile-first” strategy – meaning the solutions were built from the ground up to support mobile devices as the primary interface with the ability to work well in the “consumer world” of diverse platforms, apps, etc. How this consumer world interoperates with the more closed world of educational systems and institutions is a problem that requires agreed upon interoperability to address enable at scale. There is great opportunity for those organizations that can work with IMS to begin to plug some of these gaps – and it is beginning to happen. Gartner Group: Albeit not released at EDUCAUSE, Gartner’s July report on the Hype Cycle for Education covers something called “Exostructure Strategy” – leveraging interoperability to enable more friction-less partnering - whose description includes several IMS standards as the enabling technology – as having transformational potential. Since Gartner has had literally zero interaction directly with IMS, it is clear that this is a trend that their institutional and supplier members are telling them about. University of Central Florida: We were blown away by UCF’s LTI app development work – and their leadership in getting the message out on how institutions can and should be realizing the architecture for innovation/exostructure strategy! What do you think? Beginning of alignment toward an architecture for educational innovation? 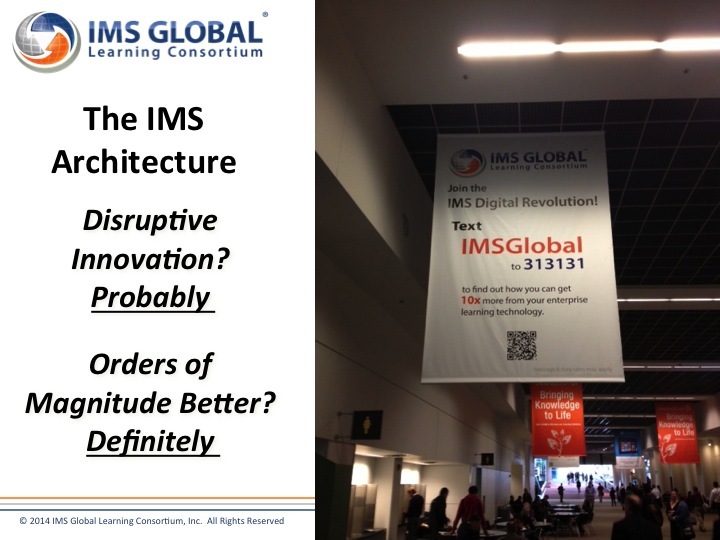 Here are the intro slides from our IMS panel session on the topic.